Koroncó-Zöldmajor is located in the middle of a grove of slender pine-trees. People with mental deficiency live and work here in a run-down castle built in the past century. The new accommodation building explores the most elementary architectural traditions; its simplicity is a reaction to the homogeneity of its surroundings. 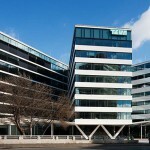 → see the building on the map „hungarian architecture”! Everything radiates calmness and tranquility. The closeness of nature is extremely important here; preserving the existing trees had great importance during the design process. With the disposition of the new building (and with a 3rd, planned one) the aim was to create a central space between these and the old castle. The two-storey building has a simple rectangular plan and a pitched roof. Its unusual feature is the open-ended gables on the roof, separating the roof structure and the porch hanging from one side of it from the enclosed, box-like volume containing the accommodation. The double-height porch runs the length of the building on the entrance front. Its screen consists of wooden slats, sometimes solid, sometimes spaced. The tiled pitched roof covers the whole building, including the porch, and acts like a canopy, open to the elements at either end. 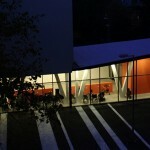 Forms, characters and moods dissolve into one another throughout the building, and between the building and nature. Sunlight penetrating the interior spaces brings the browns and yellows of the walls to life, as a response to the beauty of the surrounding pine woods. The outer walls also appear to identify with nature: the alternation of plain and painted window frames, the muted pastel shades of the walls, despite the measured geometry of the forms and structure, add up to a mirror image of the surroundings, and a heterogeneous, almost „picturesque” impression. 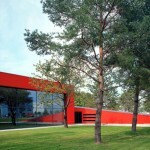 Maria Thuroczy: Rehabilitation Institute in Koronco - in: architectuul.com, 2011.12.01. 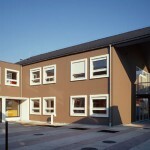 Accommodation Building for Mentally Disabled - in: world-architects.com, 2004. 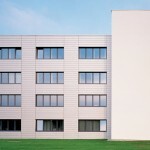 Péter Haba: Fusions – Rehabilitation institute for the Mentally Disabled in Koroncó, New Accomodation Building - in: 2 buildings, 2004.